I recently overhauled an old Powermatic Model 45 Wood Lathe, serial number 545148. This lathe had been hard used over the years. It came with a 3-phase motor and the speed change lever was nearly impossible to move. The bearings rumbled and there was evidence of wobble at the spindle. The following are the procedures I used. They may help you, or not. I don’t know your level of expertise with tools nor what tools you may have available. For this reason, use the described procedures at your own risk. I first tried an electronic phase converter. This allowed the motor to start, but proved unsatisfactory. The phase converter provides a startup "third phase" but cuts out after the motor is spinning, leaving it to operate on two phase power. This means that one set of windings isn't producing any torque, and it seemed to me that the power was reduced (from 3/4hp to 1/2hp) and the motor also didn’t seem to spin evenly. This may have been subjective, but subjective or not, I determined to restore the old machine to its status as a professional-level lathe. I removed the handle, the cap, and using a brass drift punch, the shaft on the speed change lever. This shaft was slightly rusty but most of the problem appeared to be fine sawdust that had filtered in over the years. I cleaned, oiled, and reinstalled the shaft and it worked great. I tried replacing the motor with a Baldor 3/4hp, but this motor has a longer frame than the Baldor 3/4hp 3ph motor that came with the lathe. After receiving a suggestion online, I ordered a Leeson 3/4hp 1ph motor, and this worked fine. It has the same length overall as the original Baldor motor. I also replaced the drive belt that connects the motor to the transmission spindle above it. The belt I bought was about 1”longer than the original. It worked, but life would be simpler if you could get an exact replacement or even one that is slightly shorter. Unplug the unit and then disconnect the cable from the motor at the switch. Loosen the cable retainer and pull the cable out of the switch housing. The motor is suspended from a flat plate which is in turn suspended from two shafts which extend into the lathe bed casting. Remove the third shaft, which serves to prevent the motor mount from traveling upward under load. Then loosen the two Allen-head screws in the bed casting that hold the vertical shafts that support the motor mount. Slip the belt off the motor pulley and the motor will drop straight down. Be prepared to support it…the motor is heavy. Four bolts and nuts hold the motor to the mounting plate. Remove these. The motor is now free and can be moved out of the way. I now removed the transmission spindle that connects the motor to the spindle in the headstock. Two bolts and nuts are found at the left end of the casting. Loosen these, then slide the right half of the VS pulley off its shaft. It's not necessary to remove the nuts, just slide the bolts free as the shaft drops down. It may help to retract the left half of the VS pulley on the headstock spindle to allow the flat drive belt to drop down to the bottom of the shaft. This gives a little more play in the belt when removing the transmission shaft. Slide the flat belt off the end of the transmission shaft, then remove the unit. Re-installation is the reverse of this, after you’ve replaced the bearings and flat VS pulley drive belt. Warning: Don't remove the snap ring that is found on the right side of the VS pulley assembly. Removing this allows the spring to escape and complicates matters enormously. Treat the VS pulley as a subassembly and remove/reinstall it as a unit. Warning: Don't loosen the setscrews on the spacer between the indexing wheel and the front bearing. This may allow the 1/4" key to move in its slot and jam the VS pulley assembly. The key is 1/4" x 1/4" by 5". You can make a replacement from standard 1/4" square stock if the old one is damaged. 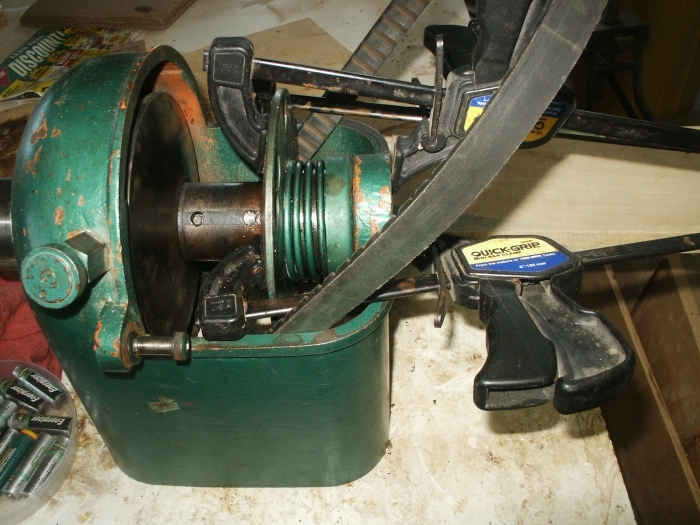 Remove the bearing spacer ring on the left end (outboard) of the spindle. Retract the left half of the VS pulley and hold it retracted with clamps. Plastic clamps work best. Use two for safety. Loosen or remove the setscrew at the bottom of the VS pulley assembly. It may help to remove the setscrew and spray WD40 into the hole. Remove the clamps from the VS pulley. Be careful…the spring has a lot of tension. Use a brass drift to drive or aid in driving the spindle. Use a bearing puller to remove the spindle, traveling right. This is preferred to driving the spindle since it prevents the 1/4" key from shifting and jamming the VS pulley sheaves. I built a "bridge" of 6" pipe, about 6" long, by welding a bar across the open end. The screw on the puller engaged this, allowing the hooks to attach to a 3" faceplate screwed onto the threaded end of the spindle. Use a brass drift to tap the spindle out after the front bearing is free of the machined recess in the spindle housing. This keeps all the spacers and the VS pulley assembly and the indexing wheel lined up as the spindle is withdrawn. Install a new flat belt if necessary. Retracting the left half of the VS pulley after the spindle is mounted in the headstock will allow the belt to drop down, and this gives a little more freedom of movement during reinstallation. Locking the indexing wheel lock to prevent the indexing wheel from rotating during the removal/reinstallation helps align the key slots. Align the headstock using the installed split pin guides. Then use the four bolts to pull the headstock into final position. The flat VS belt can be had cheaply on ebay, supposedly. Gates has it for about $45 if all else fails. For motor reinstallation, I removed the support shaft located at the right front of the mounting plate. I left the shaft at the left rear in place. It's easier to slide one support shaft into its well than two, when trying to support a heavy motor in an awkward position. This support shaft can be placed into its well, pushed up as high as possible and then secured with the allen screw. Make sure the allen screw engages the machined flat on the shaft. Bolt the replacement motor onto the mounting plate. Take the pulley off the old motor and install it on the new one, keeping the distance from the face of the motor approximately the same as it was on the old motor. I found it easier to put a knee into the cabinet, then lift the motor into approximate position. Using the knee for support and guiding the support shaft with my hands, slide the shaft into its mounting hole at the rear of the casting. Support the motor, then tighten the allen screw that supports the motor. Loosen the allen screw supporting the other suspension shaft, then reattach it to the motor mounting plate. Attach the drive belt to the pulley. Then carefully lower the motor by loosening the two allen screws in the lathe bed. Square everything up, then tighten the two allen screws. I replaced the switch and both cables, the one which plugs into the wall, and also the short piece which connects the switch to the motor. This was pretty straightforward, so I won't describe the process. At this point, the old lathe works well. I'm considering installing a reversing switch to aid in sanding, but that's a project for another day.